The Massachusetts Rider Education Program (MREP) has ten photo galleries from Nelson’s Ride, and tons of photos with YOU and Vinnie DiMartino. Check out the photos on their Facebook page! To minimize the risk and maximize the fun of motorcycling, the Registry of Motor Vehicles sponsors the Massachusetts Rider Education Program (MREP). 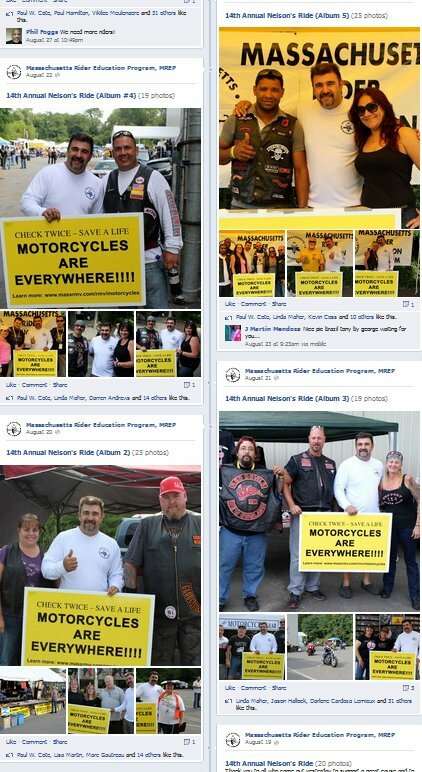 The mission of this program is to reduce the number of motorcycle related fatalities and injuries in the Commonwealth by increasing the statewide availability of Motorcycle Safety Foundation (MSF) approved training courses for motorcycle riders and to increase awareness and education for both riders and drivers. This entry was posted in Awareness, Photos, Supporters, Uncategorized and tagged massrmv, motorcycle safety, mrep, nelson's ride, vinnie dimartino on September 3, 2013 by mmsf.